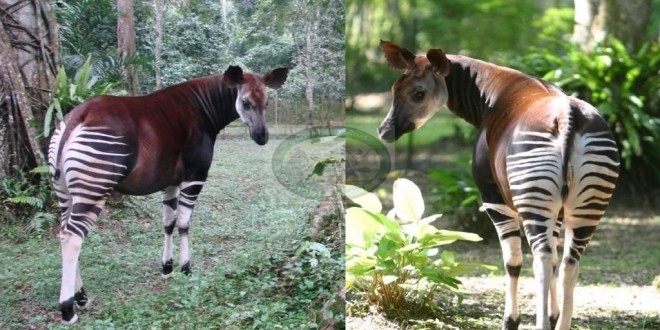 The Okapi Wildlife Reserve, established in 1992, helps protect the habitat of the okapi and many other species, as well as local indiginous people, the Mbuti pygmies. The Reserve encompasses 13,700 square kilometers (1.5 times the area of Yellowstone National Park) of the Ituri Forest in the northeastern portion of the Democratic Republic of Congo, in the very heart of Africa. Listed as a World Heritage Site in 1996, the Reserve represents a global effort to preserve rare plant and animal life and a significant human culture. The established preserve protects the Ituri lowland rainforest of the Congo River basin. It harbors a healthy population of about 5,000 okapi, 4,000 elephants, 2,000 leopards, 13 primate species including chimpanzees, Two crocodiles are found, the African slender-snouted crocodile and the African dwarf crocodile, and many other rainforest species such as forest buffalo, water chevrotain, African golden cat, leopard, giant ground pangolin, giant forest genet, Anubis baboon, bush pig, pygmy antelope, giant forest hog and a wide variety of birds and insects. It is considered as one of the most important sites for bird conservation in mainland Africa. Hunter-gatherers and shifting cultivators have occupied the Ituri Forest for centuries. The ancestries of present forest peoples can be traced back to both Sudanic and Bantu migrations as well as to more pygmoid stocks. The Pygmy groups that today inhabit the Ituri forest include the Efe and Mbuti. They excel in the use and identification of wild plants. Pygmies have a semi-nomadic hunter-gatherer lifestyle and when not hunting with traditional nets or archery, gather insects, fungi, fruits, seeds, plants and honey. They depend on wild game and fish to supplement dietary protein requirements. Most of the agrarians in the Ituri region are Bantu, the country’s dominant ethnic group that includes Lese, Mamvu, Bira, Ndaka and Budu. Long-standing economic and cultural ties exist between pygmies and traditional forest agriculturalists, with the pygmies depending on exchanges to acquire cultivated starch foods to supplement a forest diet rich in protein. Join Green Hills EcoTours and discover an unspoiled part of Africa and experience the adventure of a Lifetime.Encounter Opapi; visit epulu forest and go for hunting experience in Bambuti Pygmy village while interacting with local people including children and learn about life in this beautiful country.